TAG 2015 Review - Goriest Bus Scene Ever? OK be warned, this opening scene from the movie Tag Riaru Onigokko is pretty gory. 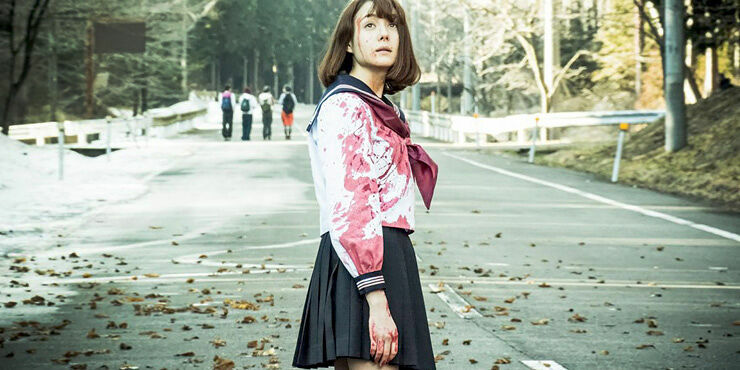 In fact it's extremely gory and it also spoiler for the opening to this cult 2015 Japanese action horror film by director Sion Sono, which it's taken from, in case you were going to watch it and didn't want to see the opening scene yet. But you will anyway. Or for that matter if you have kids (or you are a kid) getting ready to go on a school field trip. Tag Riaru Onigokko starts with a camera zooming in on two buses full of Japanese school girls who suddenly get a shock when a gust of lethal wind slices the top of the buses off—and the girls' heads too. All except one girl, Mitsuko, the film's protagonist who is saved by the grace of bending down to pick up a pen. After escaping she's then chased by this razor sharp breeze which takes down a few more people before the movie's end. You can see all of this horror and more in the video above which showcases the entire film. Just tell your boss/teacher/customers you are going to be a little bit busy for the next hour or so. They'll understand. Tag Riaru Onigokko movie character Mitsuko. The Tag Japanese movie is based on a 2001 novel by Yusuke Yamada called Riaru Onigokko and follows Japanese schoolgirl Mitsuko as her world descends into grisly chaos, and she begins to question whether what's happening to her is real or she's trapped in some kind of horrible dreamworld. She finds and joins forces with her 3 friends Aki, Sur and Taeko and together the girls muse about whether destiny is truly predetermined and whether there are multiple realities with multiple versions of themselves. Tag Riaru Onigokko descends into a dark and surreal horror survival adventure film as Mitsuko and her friends try to find a way to escape the multitude of lethal events and people who are out to get them. Plus there is always the deadly killer wind that crops up when they lease expect it. Tag is an epic Japanese horror movie. Equal parts flash-trash exploitation gorefest and punchy pro-feminist action-fantasy, “Tag” is another feather in the highly idiosyncratic cap of Japanese helmer Sion Sono. This cavalcade of carnage set in a bizarre parallel world where women are chased and slaughtered by all manner of human and supernatural forces hits the sweet spot where grindhouse meets arthouse. Promotional photo for the Tag Riaru Onigokko movie.